Elegant architecture, a great address and beautifully renovated luxury condos for sale—that’s what 2029 Connecticut is all about. 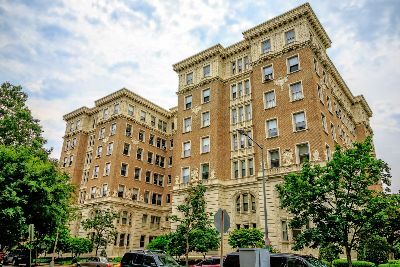 Eponymously named for its locale (at 2029 Connecticut Avenue, NW), this historic seven-story building is in the heart of Washington, DC’s very posh Kalorama neighborhood. Built in 1916, the Beaux Arts structure was once known as the Bates Warren Apartment House. This was one of the District’s grand rentals for generations, home to such notables as President William Howard Taft, and much later, liberal lion and presidential nominee George McGovern. The building has since converted to 26 very spacious condominium units with sizes ranging from 1,200 to over 5,000 square feet. 2029 Connecticut is between Wyoming Avenue and California Street, just two blocks from the lovely triangular Kalorama Park and its Kalorama Recreation Center. The exclusive neighborhood lies between two other highly popular communities—Adams Morgan is right next-door to the northeast while Dupont Circle is to the south. This stunning building features one-bedroom, two-bath units, plus three-bedroom, three-bath, and four-bedroom, four-bath layouts. The floors come in beautifully inlaid original parquet, herringbone and traditional strip hardwood, while walls are adorned by exquisitely detailed crown molding and decorative millwork. Add to that, gourmet modern kitchens with granite counters and stainless steel appliances, along with remodeled luxury spa baths with original subway tile floors, walk-in closets, soaring ceilings and numerous other rich architectural details. Residents at this pet-friendly building also enjoy a 24/7 front desk with concierge service, a doorman, parking, a fully-equipped gym, extra storage and a wonderful wooden rooftop deck with amazing skyline views as well as a catering kitchen. The neighborhood is served by the Woodley Park-Zoo/Adams Morgan Metro as well as the Dupont Circle Metro. Also worth noting are all the nearby restaurants, both along the 18th Street Corridor in Adams Morgan as well as in fashionable Dupont Circle. To learn more about 2029 Connecticut, call District Partner Real Estate at 202-798-3600.